Includes retail style box, tongs, porcelain bowl, rubber grommets, 74" MYA premium washable hose, instructions, charcoal and reusable screens. This hookah has autoseal system that can convert this single hose into a quad hose without having to plug each hose when only one hose is being used. 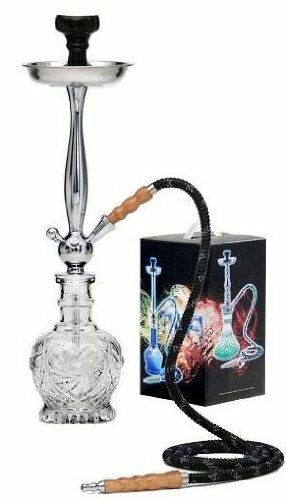 Authentic MYA SARAY ECONO THUNDER hookah will all accessories! Can be converted to a double, triple or quad hose by just adding MYA hose ports! This Hookah smokes great and is no doubt the best quality available 14 day return policy - we refund 100% if in unused condition! Shipped safely from the U.S.! Fast shipping! Bohemian crystal vase with etchings, very nice! Best quality guaranteed! If you have any questions about this product by Elite Hookah, contact us by completing and submitting the form below. If you are looking for a specif part number, please include it with your message.